While feeding a toddler isn’t always the most rewarding job, it can lead to some pleasant surprises. 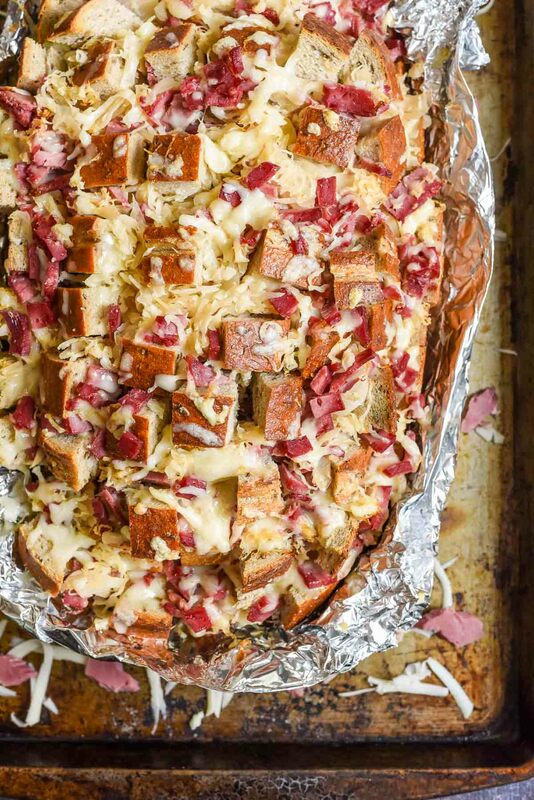 One of those happy surprises involved this giant loaf of Reuben Pull Apart Bread. I made this bread on Valentine’s Day, because 1) We’re parents now so Valentine’s Day is really just an excuse to buy the little guy a shiny red balloon. Here’s hoping he’s always super excited about a $2 gift. 2) Valentine’s Day was on a Tuesday, and babysitters are scarce, and restaurants are crowded, so going out was a non-option. and 3) The Mr. loves reuben sandwiches, and making a big loaf of reuben-y goodness seemed like the easiest way to let him know I’m still crazy about him even if I didn’t manage to get a shower all day. If you’ve never made pull apart bread before, it’s almost embarrassingly simple to put together. I start with a nice round crusty loaf of bread (I managed to find rye bread at a local Jewish deli, but Sourdough can also work). The bread is scored in parallel and perpendicular lines, then stuffed with handfuls of cheese, meat, seasonings, or whatever else suits your fancy. Because this was a Reuben-inspired bread, I used gobs of shredded Swiss, thick slices of chopped corned beef, and a sprinkling of sauerkraut for good measure. The whole thing gets popped in the oven for a few minutes until the cheese is melty and the bread is hot and golden. While it’s baking, I whip up a quick homemade Russian dressing that has just the right balance of sweetness, tang, and heat. 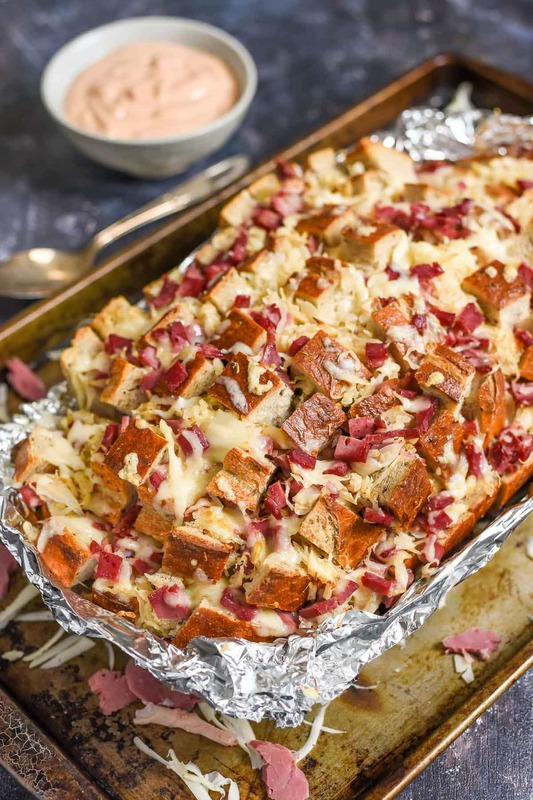 In no time at all, you have a lovely loaf bursting with stringy cheese and crisp corned beef. I fully expected our sweet child would snub his nose at this concoction (I mean, who ever heard of a kid eating sauerkraut? ), but the moment this came out of the oven, he was signing the word for “please” and not-so-patiently pointing and whining at the fragrant bread. I reached, down pulled a hunk off and handed it to him. He shoved the whole thing in his mouth, chomped away happily, and was begging for another piece less than 30 seconds later. At dinner, we all dove in. Even the little guy got in on the dipping action. The Mr. loved it and told me he’d prefer this over a $50 steak and a wife in heels any day (Ok, ok, maybe those weren’t his exact words, but he did really love this bread!) 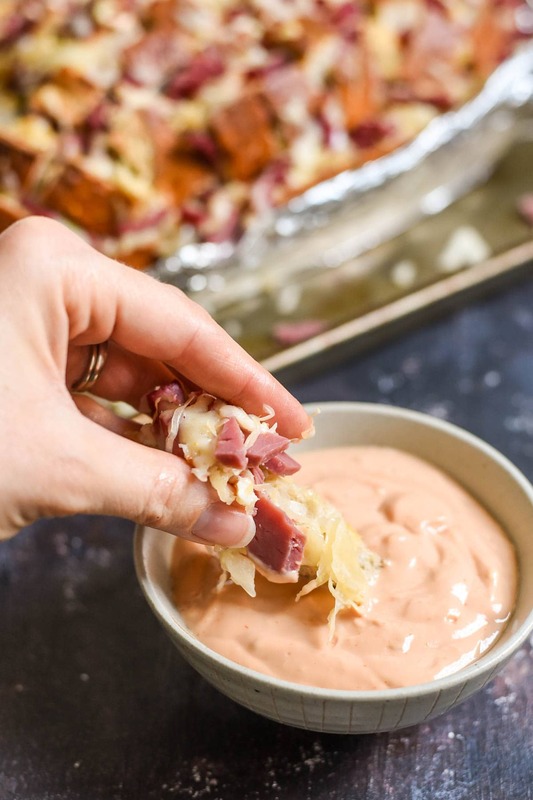 The winning flavors of a classic reuben are irresistible, even for a sometimes picky child. Unless you plan on eating the entire loaf, you might want to slice and plate the bread in appropriate serving sizes. Otherwise, you may keep going back for nibble after nibble until suddenly your tiny family has eaten almost an entire loaf of bread in one sitting. Not that I know anything about that. Ahem. Preheat the oven to 400 degrees. To make the bread, slice it in parallel and perpendicular lines, about an inch apart, being careful not to slice all the way through the bread. Place the loaf on a baking sheet. In a bowl, mix together the cheese, meat, and sauerkraut. Using your fingers, stuff the cheese mixture into each of the rows on the loaf of bread. Place the loaf in the oven and bake for 12-15 minutes or until cheese is melty and bread is golden. Meanwhile, whisk together all of the sauce ingredients. Serve the bread warm with a side of sauce for dipping. This is definitely husband food. Ha! Mine went nuts! This is absolutely beyond genius, my friend! You are too much. Thank you! YESSSSS!!! This. Is. Amazing. I mean come on, is there really a better food for March? Corned beef and bread to go with all the beer and friends. Saving this one for sure! That’s right! Corned beef, bread, and beer for everyone! Thanks Karly! Just in time for St. Patrick’s Day! Can’t wait to try it. 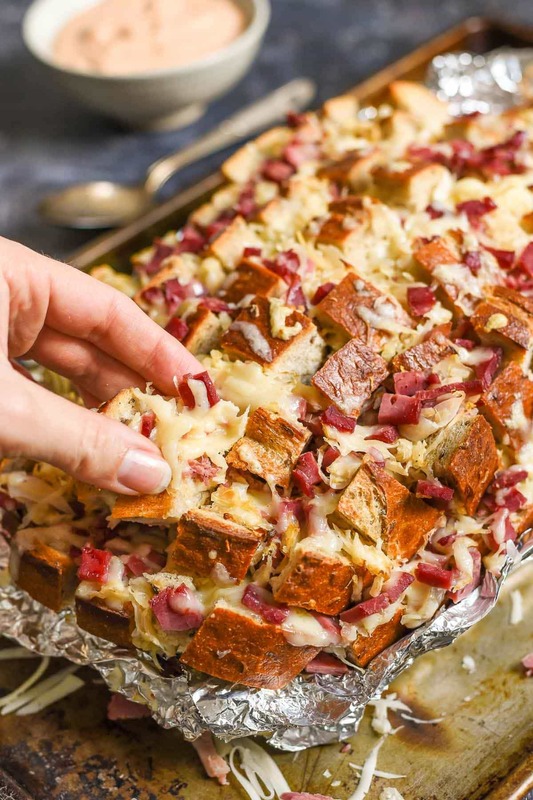 I’ve only made pull apart bread once and this makes me want to do it again!